This colorful envelope came from a favorite blog-reader-turned-pen-pal from Texas, who I think said she found this at PaperSource. WOW! 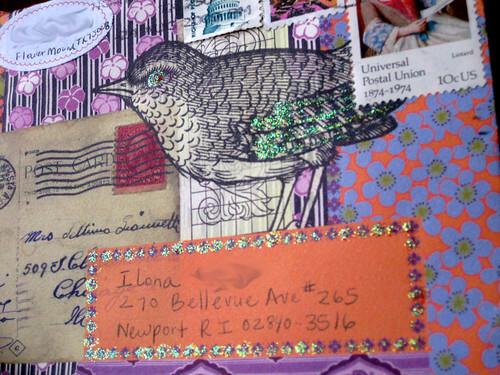 I love the bird-over-mail-ephemera theme, and of course she used exquisite stamps, including an owl stamp to continue the bird theme. Check out that glitter! I was able to turn this envelope at an angle in the light, and I think I did a pretty good job photographing the glitter this time, if I do say so myself. Not sure if the glitter came on the envelope and label, or if she added it. The crazy combination of patters continues on the back. What an envelope! I definitely couldn't pass that up if I saw it in a store. UPDATE 10/29/2009: the sender did add the glitter herself. 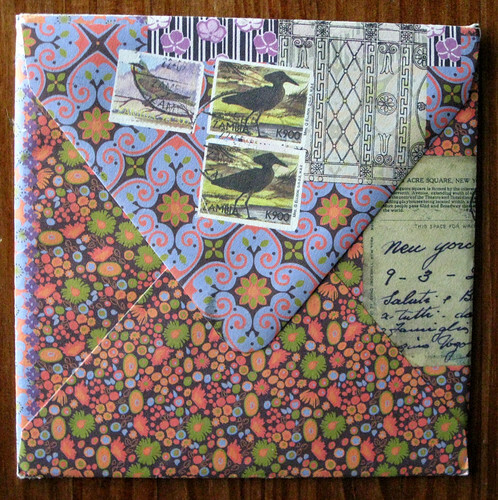 hey, I absolutely love this envelope... Now i feel a little bad cause I didn't spend any time on creating beautiful envelopes for my pen pals in the past ... I deffinitely have to get back to it! Sartassa - believe it or not, this envelope was store-bought and not handmade! I love it . mail art is so great sometimes. That's lovely! 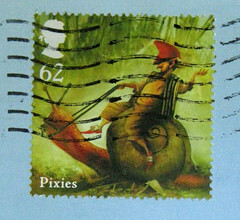 And what gorgeous stamps! I feel your pain, Ilena; there's no stationery store in my town. Thank goodness for pen pals! Getting a letter dressed up like that in my mail certainly would put a smile on my face! You say this is store-bought and not handmade, so do you mean that this envelope is made of just one paper, which actually consists of pictures of the old card and different kind of colourful parts and the bird? Yes, Sirpa - the sender said she bought it in a store, in a set. And the paper itself is smooth (even the bird, all except the glitter), as if it were made from one flat piece of paper with multiple patterns printed on it. That is quite awesome =D Wow, I'd love to get my hands on some of that! 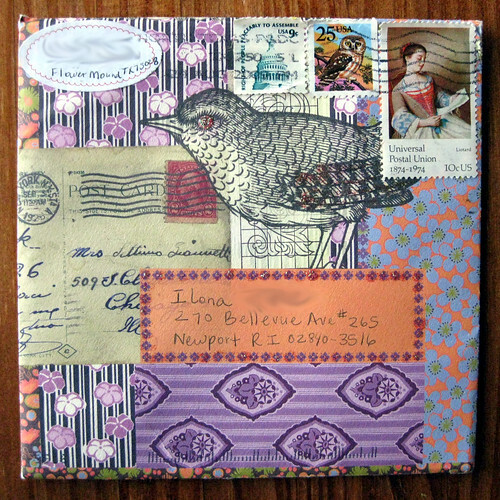 Love the variety of colors on the envelope, the stamps and the bird drawn on the front of it. Beautiful.